(1911-2009) Father of Chinese spaceflight. Leading rocket theoretician, expelled from USA as Red in 1955. Created China's space industry from scratch, results: China's first ballistic missiles, 1960s; first satellite, 1970; and first astronaut, 2003. Born: 1911-12-11. Died: 2009-10-31. Birth Place: American. Tsien Hsue-shen (Qian Xuesen), was the father of Chinese rocketry and spaceflight. A pre-eminent rocket scientist in America, he was driven from the country during the Red Scare of the 1950's. He single-handedly built a national space and rocketry program from the technology base of an agrarian society. Tsien was born in Hangzhou, China in 1911. A brilliant student, he went to the Massachusetts Institute of Technology on a Boxer Rebellion Scholarship in 1935. Becoming a prot�g� of the legendary Theodor von Karman, Tsien was the leading theoretician in rocket and high-speed flight theory in the United States. He was instrumental in the founding of the Jet Propulsion Laboratory in California, and collaborated closely with the newly-founded Aerojet Corporation in the development of the first JATO and sounding rockets built in the United States. Identified to the US Defence Department as a key person in the future development of military technology for the United States, Qian was a member of Project Lusty - a team of top scientists that entered Germany just behind the American lines, locating and returning to the United States key documents and personnel of the advanced German aircraft and rocketry programs. The team left for Europe before the war even ended. By May 5 Tsien found himself interviewing Wernher von Braun and other members of the V-2 Rocket Team in Kochl. Von Braun prepared for Tsien a seminal report, �Survey of Development of Liquid Rockets in Germany and Their Future Prospects', which provided the road map for future space vehicle development in the United States. Rudolph Hermann revealed that Tsien's theories of supersonic flow had been confirmed in German wind tunnels during the war. Such facilities had not been available in the United States. The Lusty Team moved on to the Hermann Goering Luftfahrtforschungsanstalt near Volkenrode in Braunschweig. This camouflaged secret facility had carried out advanced aerodynamics work during the war. Von Karman encountered old acquaintances from his days as a professor in Aachen there. Despite attempts to destroy the most secret documents, the team recovered 3 million pages - 1500 metric tons - of technical papers from Volkenrode. These laid the groundwork for American post-war jet aircraft development. A single set of documents providing details of the design of swept wings to transonic aircraft was deemed so important that the Boeing's George Shairer microfilmed the details and returned to Seattle in July. The XB-47 design was revised to a podded-engine swept-wing, becoming the ancestor of the B-52 and all subsequent Boeing transports. Meanwhile Tsien was devoting his time to the German work on the Pfeilflugel. The concept had first been proposed by Alfred Busemann in 1937 and elaborated by Hans Lippisch during the war. On May 28 Lippisch briefed the Lusty Team in Paris on his work on the Me-163 tail-less rocketplane and the unflown DM-1 pure delta glider. Returning from Germany, Tsien edited the leading findings of the project in the 800-page Jet Propulsion, which would become the classified technical Bible for post-war aircraft and rocket technical research in the post-war United States. By 1949 Tsien applied the knowledge learned to the design of a practical intercontinental rocket transport. He proposed a 5,000 km single stage winged rocket clearly derived from V-2 aerodynamics. The 22,000 kg rocket would carry ten passengers from New York to Los Angeles in 45 minutes. It would take off vertically, with the rocket burning out after 60 seconds at 14,740 kph at 160 km altitude. After a coast to 500 km, it would re-enter the atmosphere and enter a long glide at 43 km altitude. Landing speed was to be 240 kph. Tsien's fundamental theoretical work on this concept lead to him being called the �Father of the Dyna-soar' (a 1950's/1960's delta winged spaceplane that was the ancestor of the space shuttle). But at this same period Tsien's homeland was undergoing a chaotic period of civil war leading to the victory of Mao Tse-tung's Communist forces. In the larger world, the Cold War struggle had begun. Stalin had exploded an atomic bomb and it was revealed that the technology had been stolen from the Americans by wartime Soviet spies. In backlash, McCarthyism took root in the United States. Tsien seems to have undergone a similar personal struggle of loyalty and allegiances at the same time. 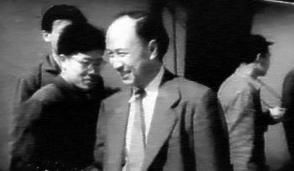 On the one hand, Tsien married the cosmopolitan daughter of a senior military adviser to Chiang Kai-shek in 1947, applied to become a US citizen in 1949, and had become one of the senior scientists advising the US military on post-war development of rocket technology. He had begun pioneering and highly secret work on the use of nuclear rocket engines. On the other hand, Tsien was revolted by the corruption of the Chinese nationalists, faced racial discrimination in the United States, and constantly vacillated in his desire to return to his homeland. He, like other Chinese scientists in the United States, began to receive letters from their relatives indicating that hardships awaited them unless their expatriate son returned to the motherland. Events culminated on June 6, 1950. Just weeks before North Korean forces invaded the southern Korean zone, leading to a war that would bring the United States and China into direct military conflict, Tsien was visited by the FBI. He was accused of being a Communist party member in the 1930's and his security clearance was revoked. By this time nearly all of Tsien's work was classified, and denial of the clearance destroyed his ability to continue further. He decided to leave China, but was instead thrown into a prison cell on Terminal Island by the US Immigrations Service. Leaders in Washington had decided that Tsien knew too much for him to be allowed to move to a Communist country. He was detained under virtual house arrest for five years, while his technical knowledge become more and more dated. In the 1955 Geneva talks on return of American prisoners of war, release of Tsien was made an explicit condition of the Chinese. Eisenhower himself agreed to do so, and in September 1955 Tsien left for China. Building rocket and aircraft technology in China was to be a long process. Achieving the indigenous technologies in metallurgy, machinery, and electronics was an enormous task. The Russians provided an R-2 rocket, an improved version of the V-2, as a starting point. Chinese political upheavals - the Great Leap Forward, the Cultural Revolution, Tsien's backing of the disgraced Lin Biao - further delayed progress. But by 1960, Tsien launched the first Chinese-built R-2. By 1970, he had launched China's first satellite using his DF-2 rocket. In 1968 Tsien founded the Space Flight Medical Research Centre to prepare for manned flights. The large two stage FB-1 and CZ-2 rockets, the basis for China's ICBM and all existing Chinese space launch vehicles, first flew in 1972. Launches of the FSW photo reconnaissance satellite, with a recoverable re-entry capsule nearly large enough to accommodate a pilot, began in 1974. Tsien's manned spacecraft design proposed in the late 1970's was a winged spaceplane, launched by a CZ-2 core booster with two large strap-on boosters. It so strongly resembled the cancelled US Dynasoar of 15 years earlier that US intelligence analysts wondered if it wasn't based on declassified Dynasoar technical information. It would seem that this was to be preceded by a simpler manned capsule. This was apparently Tsien's last attempt at a manned program while still actively heading the space program. Tsien had managed to keep in the favor of the changing Chinese regimes over the years. He was a dedicated Communist who's technical advice on agriculture contributed to the death of millions during the Great Leap Forward in 1958. He met Mao six times and tutored him personally in 1964. He survived the Cultural Revolution of 1968 and supported the Tiananmen Massacre in 1989. His active career came to a close when he was awarded the State's highest award, State Scientist of Outstanding Contribution in October 1991. A new manned space program would be approved in 1992, led by leaders and engineers trained in Russia in the late 1950's. Tsien lived out the balance of his life in seclusion in a guarded residential compound in Beijing. Country: China. Launch Vehicles: Tsien Spaceplane 1949. 1911 December 11 - . Birth of Tsien Hsue-shen - . Nation: China. Related Persons: Tsien. (1911-2009) Father of Chinese spaceflight. Leading rocket theoretician, expelled from USA as Red in 1955. Created China's space industry from scratch, results: China's first ballistic missiles, 1960s; first satellite, 1970; and first astronaut, 2003..
1935 August 15 - . Tsien Hsue-shen leaves China to study at MIT. - . Nation: China. Related Persons: Tsien. Program: Long March. Tsien Hsue-shen, father of Chinese rocketry and spaceflight, leaves China on a Boxer Rebellion Scholarship to study at MIT..
1937 June 1 - . Jet Propulsion Laboratory forerunner established. - . Nation: USA. Related Persons: Tsien. Theodore von Kármán, Director of the Guggenheim Aeronautical Laboratory at the California Institute of Technology at Pasadena, founded group which began experiments in design fundamentals of high-altitude sounding rocket. The group, named the Cal Tech Rocket Research Project, consisted of Frank J. Malina, Tsien Hsue-sen, A. M. O. Smith, John W. Parsons, Edward Forman, and Weld Arnold. This was the origin of the Jet Propulsion Laboratory. 1949 During the Year - . Tsien Passenger Spaceplane - . Nation: China. Related Persons: Tsien. Class: Manned. Type: Manned spaceplane. Spacecraft: Tsien Spaceplane 1949. Tsien Hsue-shen proposed a 22,000 kg single stage winged rocket that would carry ten passengers from New York to Los Angeles in 45 minutes..
1950 June 6 - . Tsien Hsue-shen accused of being a Communist. - . Nation: China. Related Persons: Tsien. Program: Long March. FBI agents interrogate Tsien Hsue-shen on allegations that he is a Communist. The same day his security clearance is revoked, making it virtually impossible to continue meaningful work in rocketry. The allegations seem unlikely to his associates at CalTech (his wife was the daughter of one of Chiang Kai-shek's leading military strategists). Two weeks later, Tsien announces his intention to return to China. Tsien, denied the possibility to work, becomes enmeshed in a tug-of-war between differing viewpoints in the US government bureaucracy: those that want to deport him as an undesirable alien, and those that want to keep him in the country because of what he knows. 1955 September 17 - . LV Family: V-2. Launch Vehicle: DF-1. Tsien Hsue-shen deported from the United States. - . Nation: China. Related Persons: Tsien. Program: Long March. After five years of wrangling, and secret talks in Geneva between the Red Chinese and US governments, Tsien is deported from the United States. Upon arrival in China, he was immediately put to work as head of the Chinese missile program. He had to introduce US systems engineering approaches to Chinese engineers, and build the technical infrastructure to enable China to build rockets. 1956 January 5 - . Institute of Mechanics founded in Beijing - . Nation: China. Related Persons: Tsien. Tsien is director of the institute. It is equipped with mechanical desk calculators and only one telephone. Deputy Director is a Tsien protege, Dr Guo Yonghuai, who graduated with a doctorate in aeronatuical engineering from Caltech in 1946. The Director of Operations is Xu Guozhi, a systems analyst that Tsien met on the ship from America to China. 1956 February 17 - . LV Family: V-2. Launch Vehicle: DF-1. Plan for missile development proposed. - . Nation: China. Related Persons: Tsien. Program: Long March. Tsien Hsue-shen submits a secret proposal to the State Council for ballistic missile development - 'Prospectus for Establishment of a National Defence Aviation Industry'. The proposal calls for the establishment of a research facility for aeronautics and missile development. 1956 March 1 - . LV Family: V-2. Launch Vehicle: DF-1. 12 year plan for Chinese aerospace - . Nation: China. Related Persons: Tsien. Spacecraft: Project 581. Hundreds of Soviet and Chinese scientists put together the technology portion of China's 12 year plan. Missile development is emphasized in the plan at the expense of the aircraft industry..
1956 May 26 - . LV Family: V-2. Launch Vehicle: DF-1. Fifth Academy founded. - . Nation: China. Related Persons: Tsien. Program: Long March. The Fifth Academy of the Ministry of National Defence is founded for development of ballistic missiles. Tsien is named its first Director on October 8. The Academy is established on the premises of an old hospital and two sanatoriums, with an initial staff of 100 high school graduates and 100 to 200 college graduates. Tsien teaches an 'Introduction to Rocket Technology' course while Zhuang Faggan from CalTech teaches aerodynamics. 1957 July 17 - . Qian Weichang denounced. - . Nation: China. Related Persons: Tsien. Tsien denounces his former colleague Qian Weichang..
1957 October 15 - . LV Family: V-2. Launch Vehicle: DF-1. Russia to assist China in missile development - . Nation: China. Related Persons: Tsien. Program: Long March. Russian and China sign New Defense Technical Accord, whereby Russia will supply China with protoype atomic bomb and two R-2 missiles, and related technical data. Under the agreement the Soviet Union will provide to China the necessary specialists, training, and tooling for licensed production of the R-2 ballistic missile (an improved version of the V-2). 1957 December 24 - . LV Family: V-2. Launch Vehicle: DF-1. R-2 missiles arrive in China. - . Nation: China. Related Persons: Tsien. Program: Long March. A Red Army missile battalion with two R-2's and their launchers arrive in Beijing by rail. They are secretly moved to the premises of the Fifth Academy in the middle of the night..
January 1958 - . Launch Vehicle: R-12. Project 581 - . Nation: China. Related Persons: Tsien. Spacecraft: Project 581. The first project to build a Chinese satellite is set in motion..
April 1958 - . LV Family: V-2. Launch Vehicle: DF-1. Fifth Academy expansion begins. - . Nation: China. Related Persons: Tsien. Over the next year, the People's Liberation Army transfers 3000 technical staff and cadres to the Fifth Academy and a further 300 engineers to industry. The Chinese government sends increasing numbers of Chinese engineers to Russia for training in missile technology. All of this is done in great secrecy, with correspondence being addressed only to post office box numbers. Tsien self-criticism - . Nation: China. Related Persons: Tsien. An article by Tsien confessing to his mistakes was published in the People's Daily..
1958 May 17 - . Launch Vehicle: R-12. Project 581 pressure. - . Nation: China. Related Persons: Tsien. Spacecraft: Project 581. Chairman Mao says that China must orbit a satellite at the earliest possible date in order to match the Americans and Russians..
Tsien and Great Leap Forward - . Nation: China. Related Persons: Tsien. An article by Tsien appeared in Kexue Dazhong, claiming that new methods and a new process cycle could increase agricultural production by twenty times. This led to Mao's 'Great Leap Forward', resulting in the death of millions from starvation..
Second half of 1958 - . LV Family: V-2. Launch Vehicle: DF-1. R-2 technical documentation delivered. - . Nation: China. Related Persons: Tsien. 10,151 volumes of R-2 technical documents are delivered to Beijing. China orders 12 more R-2 missiles. 100 Soviet technicians arrive as advisors to the Chinese in production and operation of th emissiles..
1958 September 1 - . Tsien enters Congress - . Nation: China. Related Persons: Tsien. Tsien was elected Deputy of Guangdong Province to the National People's Congress..
1958 September 19 - . LV Family: V-2. Launch Vehicle: DF-1. Missile development plans set. - . Nation: China. Related Persons: Tsien. Program: Long March. Fifth Academy finalizes plan to proceed development of indigenous Dong Feng missiles (original DF-1, DF-2, DF-3 designations). 1958 December 1 - . Tsien joins Communist Party - . Nation: China. Related Persons: Tsien. Tsien was allowed to join the Communist Party..
January 1959 - . LV Family: V-2. Launch Vehicle: DF-1. R-2 production advisors - . Nation: China. Related Persons: Tsien. The first Soviet advisors arrive to assist the Chinese in production of the R-2 missile.. Early 1959 - . Launch Vehicle: R-12. Chinese plan satellite launch by December 1959 - . Nation: China. Related Persons: Tsien. Spacecraft: Project 581. Tsien and his colleagues set an initial goal of launching a satellite by the end of 1959. They see no reason to copy the antiquated R-2 missile being transferred from Russia, and want to make a great leap to an intermediate range missile capable of serving as the first stage of a satellite launcher. It very quickly becomes that this is much too ambitious and totally impossible. April 1959 - . LV Family: V-2. Launch Vehicle: DF-1. Chinese/Russian missile talks - . Nation: China. Related Persons: Tsien. A Chinese delegation goes to Russia to discuss delivery of more tooling and machine tools for missile production..
1959 June 20 - . LV Family: R-12. Launch Vehicle: DF-2. Decision to withhold R-12 and nuclear warhead drawing package from China over Sidewinder affair - . Nation: China. Related Persons: Khrushchev, Tsien. Spacecraft: Project 581. The Soviet Central Committee advises China it will not provide prototype or drawings of atomic bombs as agreed previously. Khrushchev promised China that he would provide the drawing package for the R-12 IRBM as soon as testing was completed. However then came the affair of the Sidewinder. At the end of 1958 or early 1959 a complete missile fell into the hands of the Chinese. They promised to provide it to the Russians, but then dragged their feet. They were finally told in February 1959 that unless they provided the Sidewinder, they would not be given the R-12 package. The missile was finally delivered but it was found that the key crystal in the infrared homing sensor was missing. The Chinese had also been caught disassembling a P-15 cruise missile at a training facility in China. It had taken the Russian trainers two days to get it reassembled correctly. Therefore on June 20 1959 the decision was taken not to transfer the R-12 or the promised nuclear warhead design to China. The Soviets created a new design bureau to copy the Sidewinder. Fabrication of the crystal for the infrared sensor was the main obstacle. The initial production batches had a 99% rejection rate. A state commission was set up to get to the bottom of the problem, but couldn't find a solution. The main problem seemed to be low-quality ore provided by the mines. July 1959 - . LV Family: V-2. Launch Vehicle: DF-1. Chinese/Russian missile talks - . Nation: China. Related Persons: Tsien. A second Chinese delegation goes to Russia to press for delivery of more tooling and machine tools for missile production..
1959 September 15 - . LV Family: V-2. Launch Vehicle: DF-1. First missile factories built. - . Nation: China. Related Persons: Tsien. Program: Long March. First Chinese missile production factories built: Shenyang (missile frames) Nancheng (engines)..
October 1959 - . LV Family: V-2. Launch Vehicle: DF-1. Project 1059 - . Nation: China. Related Persons: Tsien. Nie Rongzhen, Senior Commander of the Revolution responsible for strategic weapons, orders the Fifth Academy to quit wasting time on trying to leapfrog Soviet technology and concentrate on copying the Russian R-2. Code name for the project is 1059..
Late 1959 - . LV Family: V-2. Launch Vehicle: DF-1. R-2 production obstacles - . Nation: China. Related Persons: Tsien. Spacecraft: Project 581. 14 manufacturers and 1400 industrial work units were needed to manufacture the R-2 engines alone. Basic materials were difficult to get. Some were imported; others substituted. Eventually 40% of the parts of the missile used substitute materials, but many of these replacements proved to be inadequate. Machine tools were not available, and the missile frame was formed manually by human muscle power. Inert gas arc welding technology had to be developed. Soviet style factories were being erected for the production of the missile. 1960 April 18 - . Launch Vehicle: T-7. T-7 motor test - . Nation: China. Related Persons: Tsien. Tsien reviewed rocket development in Shanghai and views a T-7 motor test..
1960 August 12 - . LV Family: V-2. Launch Vehicle: DF-1. Soviet/China break. - . Nation: China. Related Persons: Tsien. In the preceding months relations between the Soviet advisors and Chinese engineers had been strained by increasing Soviet secrecy. The Russians catch Chinese students at the Moscow Aviation Institute stealing restricted missile data. Finally Khrushchev declared the suspension of military assistance to China. All 1,343 Soviet specialists are withdrawn from the Fifth Academy in Beijing and return to Russia. They leave behind 343 uncompleted contracts. A total of 257 technical development projects were cancelled as a result. 1960 August 23 - . LV Family: V-2. Launch Vehicle: DF-1. Last Russian advisers leave China. - . Nation: China. Related Persons: Tsien. Program: Long March. The last Russian technical advisers are withdrawn from China..
1960 October 20 - . LV Family: V-2. Launch Vehicle: DF-1. DF-1 launch preparations - . Nation: China. Related Persons: Tsien. Tsien goes to Jiuquan to supervise preparations for launch of the first Chinese-built R-2..
1960 November 14 - . Launch Vehicle: DF-3. DF-3 ICBM development begun. - . Nation: China. Related Persons: Tsien. Program: Long March. Tsien appoints himself head of the DF-3 project - a quantum leap to build a 10,000 km range liquid oxygen/kerosene propellant intercontinental ballistic missile. The objective proves much too ambitious and is eventually cancelled. It is the last missile project Tsien is allowed to manage. First Chinese trainees in satellite technology - . Nation: China. Related Persons: Tsien. Spacecraft: DFH-1. Four engineers from the Shanghai Institute of Machine and Electrical Design receive the first Chinese training in satellite design.. Early 1962 - . LV Family: DF-3. Launch Vehicle: DF-4. Chinese project management - . Nation: China. Related Persons: Tsien. Tsien introduced a computer tool for management of Chinese aerospace development projects analogous to the American PERT program..
Tsien and Mao - . Nation: China. Related Persons: Tsien. Tsien tutors Mao on science. This is one of only six times that Tsien actually met Mao..
1964 September 12 - . LV Family: DF-3. Launch Vehicle: DF-1, DF-3 Tsien, DF-4. Chinese missiles redesignated and new development plan adopted. - . Nation: China. Related Persons: Tsien. Program: Long March. Tsien had conducted a series of meetings with the Chinese leadership during the year to redefine China's missile development plans. There are clashes between Tsien, who favours an American engineering approach, and his staff, who were trained in Russian and favour the Soviet approach. Finally the missiles were defined by their target objectives, and a new development plan was adopted, with definite goals. The 1059 missile (copy of Russian R-2) was redesignated DF-1. The DF-2 was to be improved to carry an atomic bomb to a range sufficient to hit Japan. The DF-3 ICBM was cancelled, and the new DF-3 project would involve development of a nuclear-tipped missile capable of reaching the Philippines (earlier referred to as the DF-1). The DF-4 was to be capable of hitting Guam, and the DF-5 would be an ICBM capable of reaching the United States. The DF-2, DF-3 and DF-4 would use strap-down accelerometer guidance packages, while the DF-5 was to be equipped with a full-fledged inertial guidance unit. 1964 November 4 - . LV Family: R-12. Launch Vehicle: DF-2A. Go-ahead for DF-2A. - . Nation: China. Related Persons: Tsien. Program: Long March. Decision to proceed with DF-2A extended range version of DF-2. January 1965 - . LV Family: DF-3. Launch Vehicle: Chang Zheng 1. Project 651 - . Nation: China. Related Persons: Tsien. Spacecraft: DFH-1. Tsien presents his plan for a Chinese satellite to the Central Committee..
1965 April 29 - . LV Family: DF-3. Launch Vehicle: Chang Zheng 1. Chinese satellite plans. - . Nation: China. Related Persons: Tsien. Spacecraft: DFH-1. Tsien says he can orbit a Chiense satellite in 1970 or 1971..
1965 August 10 - . LV Family: DF-3. Launch Vehicle: Chang Zheng 1. Project 651 - . Nation: China. Related Persons: Tsien. Spacecraft: DFH-1. Zhou En Lai approves the plan for the construction and launch of China's first satellite..
1966 January 4 - . LV Family: DF-3. Launch Vehicle: DF-4. Chinese ICBM plans - . Nation: China. Related Persons: Tsien. Tsien proposes to add electronic countermeasures and other penetration aids to the DF-5 ICBM in order to defeat the planned American ABM system..
May 1966 - . LV Family: DF-3. Launch Vehicle: Chang Zheng 1. DFH-1 satellite defined. - . Nation: China. Related Persons: Tsien. Spacecraft: DFH-1. The satellite will be launched by the CZ-1 launch vehicle, a DFH-2 IRBM with a new upper stage..
1966 June 6 - . LV Family: DF-3. Launch Vehicle: Chang Zheng 1. Cultural Revolution - . Nation: China. Related Persons: Tsien. Tsien is now head of the Seventh Ministry of Machine Building (the former Fifth Academy). Cadres accuse Tsien of spreading Nazi propaganda in China after his visit to Germany in 1946..
1967 January 23 - . LV Family: DF-3. Launch Vehicle: Chang Zheng 1. Tsien removed - . Nation: China. Related Persons: Tsien. Spacecraft: DFH-1. Tsien was overthrown by the 916 (Mao) Clique. Ye Zhengguang, a missile engineer, with the approval off Zhou En Lai and Marshall Nie, confronts Tsien and removes him from his post as head of the Seventh Ministry. Minister of Machine Building Wang Bingzhang was also deposed. However Tsien was protected by the leadership, made a 'Vice Minister', and claimed he supports the coup. Wang refused to cooperate and would not hand over the chops of his office to the 916 Clique. 1968 June 8 - . LV Family: DF-3. Launch Vehicle: Chang Zheng 1. Height of Cultural Revolution - . Nation: China. Related Persons: Tsien. Spacecraft: DFH-1. Yao Tongbin, a metallurgist at he Seventh Ministry, is beaten to death by Red Guards. Zhou En Lai intervenes, putting the top fifty missile scientists under this protection..
1970 April 24 - . LV Family: DF-3. Launch Vehicle: Chang Zheng 1. DFH-1 satellite launch authorised. - . Nation: China. Related Persons: Tsien. Spacecraft: DFH-1. Mao personally authorises the launch..
1971 September 12 - . Death of Lin Bao - . Nation: China. Related Persons: Tsien. Lin Bao and his entourage are killed when their aircraft crashes, purportedly while trying to leave the country. Wang Bingzhang was associated with the coup plotters, and sent to prison for several years..
2009 October 31 - . Death of Tsien Hsue-shen (Qian Xuesen). - . Related Persons: Tsien. (1911-2009) Father of Chinese spaceflight. Leading rocket theoretician, expelled from USA as Red in 1955. Created China's space industry from scratch, results: China's first ballistic missiles, 1960s; first satellite, 1970; and first astronaut, 2003..